Detail of 1769 map drawn by Captain Joseph de Urrutia who accompanied the Rubí inspection expedition to province of Tejas in northern New Spain as its official cartographer. Mission Dolores is marked by a church symbol above the words “Los Ays.” To the far right is Presidio Los Adais, the former capital of Tejas on the far eastern edge of New Spain. From the famous map, entitled Mapa, que comprende la Frontera, de los Dominios del Rey, en la America Septentrional, published in 1769. Map source: American Memory collection, Library of Congress. The ending of the French and Indian War in 1763 was a pivotal event for all of the French/Spanish borderlands in North America. Just prior to the end of the conflict in 1762, when it was clear that the British would prevail, the French ceded all their possessions west of the Mississippi River to their Spanish allies. (New Orleans was also ceded to Spain, even though it was just east of the Mississippi River.) This cession prevented the British from gaining complete control of the Mississippi River. Since the post at Natchitoches was now Spanish, inspections of the presidios and missions of the province of Texas were undertaken to determine the necessity of maintaining them now that the “French threat” had ended.. The 1767 military inspection of the Marqués de Rubí at Presidio de los Adaes came to the same conclusion that the Rivera inspection had reached 40 years earlier at Presidio de los Tejas. Even though the soldiers at Los Adaes had proven their worth on various maneuvers during the life of the presidio, there was clearly a lack of emphasis placed on maintaining the defensive aspects of the presidio. There had been, in fact, no real threat of a French or American Indian attack, and since Fort St. Jean Baptiste had a more strategic location on the Red River, there was no longer any need for Presidio Los Adaes. One year after the 1767 military inspection, Mission Dolores and the other missions of East Texas were inspected by Father Solís. He observed no Indians living at any of the missions in East Texas and that only 11 baptisms had been performed at Mission Dolores from 1721 to the time of his1768 inspection. Even though the effort to congregate the Indians at the missions had failed, the tone of the Father's report was benevolent as he acknowledged that the missionaries were tending to the spiritual needs of the soldiers and settlers of the area. Like Rubí, Solís also recommended that all the missions of East Texas be closed. The actual abandonment of the East Texas presidio and missions, including Mission Dolores, did not occur until 1773. Since the priests, soldiers, and settlers of this area were under the jurisdiction of the presidio at Los Adaes, the Spanish colonists of the region came to be called Adaeseños. The Adaeseños were initially led by Joseph Gonzales in their exodus from the area, but he died on the trail from Los Adaes to the Mission Dolores area. After Gonzales’ death, Antonio Gil Y’Barbo took command. The Adaeseños continued on to San Antonio (see Los Adaes, the Final Years) and, soon after, petitioned to return to settle the area around Mission Dolores. This was no coincidence, Y’Barbo had a ranch nearby called Lobonilla. The petition, however, was denied. Instead the Adaeseños were directed to settle on the Trinity River in modern Houston County in 1774. Comanche attacks and epidemics caused the Adaeseños to leave the settlement on the Trinity River, referred to as Nuestra Señora del Pilar de Bucareli. Instead they settled around the abandoned Mission Guadalupe for the Nacogdoches. Thus, the town of Nacogdoches was established in 1779 and the area around former Mission Dolores was occupied by Spanish settlers. The tumultuous times between 1800 and 1814 resulted in a much reduced Spanish population in East Texas. After 1824 there was a large influx of Anglo settlers and by the 1830s the predominately Anglo settlement in the Mission Dolores area was referred to as the Ayish Bayou Settlement. The town of San Augustine was established in 1833, and mention of the Old Mission was made in descriptions of the land tracts including the town. Today, the descendents of old Spanish families live in Nacogdoches County, but none are now living in the vicinity of the site of Mission Dolores. 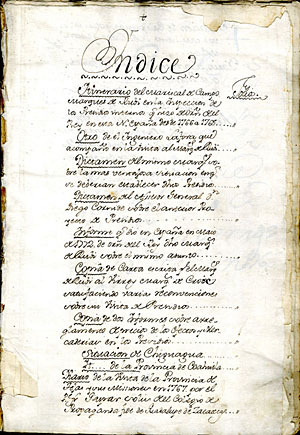 Front page from diary of the Marqués de Rubí, made during an inspection tour of presidios in Texas and the northern frontiers of New Spain between 1776 to 1768. Diaries and journals of government officials and priests often contained important information on native peoples and the environment in which they lived. Image courtesy of the Center for American History, University of Texas at Austin-CN 08492. The Marqués de Rubí whose 1766 military inspection of Presidio Los Adaes led to its closing and the decision to shut down all of the Spanish missions in East Texas, including Mission Dolores in 1774. 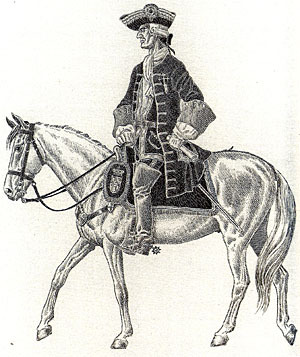 Illustration by José Cisneros entitled “Presidio Inspector El Marqués de Rubí, 1766,” from Riders of the Borderlands (El Paso: University of Texas at El Paso, 1981). Courtesy by José Cisneros and the Center for American History, University of Texas at Austin. CN 08443.